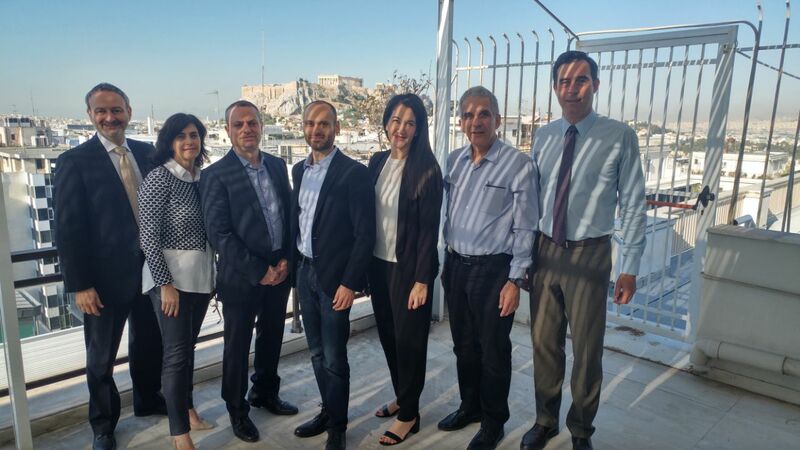 IATI, in collaboration with the National Bank of Greece and the Ambassador of Israel to Greece Ms. Irit Ben-Abba, announced the second cycle of a unique bilateral mentorship program for Greek entrepreneurs by Israeli experienced entrepreneurs. The first step of the program was made as the Israeli entrepreneurs acted as mentors at an innovation awards event of NBG, end April, in Athens. The Israeli mentors this year are: Anat Ben Baruch, Head of Business Development and Innovation at APM; Ami Harel, CEO e2es; Uri Lavie, General Manager of Picscout; and Dr. Amir Guttman, Founder & Managing Partner at Aviv VC. IATI's representative in the delegate was Member Relations & Events Manager Ms. Liri Ben Shimol . The mentorship program, one of its kind in Greece, is a cooperation between the National Bank of Greece and IATI and has been realized with the active collaboration of the Embassy of Israel in Athens. IATI has actively been seeking to develop cooperation with Greece and other business ecosystems around the world. In the case of Greece, Israeli experts provide know-how and guidance to young Greek startup entrepreneurs in developing their businesses. The mentorship is part of a series of initiatives aimed to promote Greek-Israeli cooperation in innovation and startup entrepreneurship in the framework of an MoU for cooperation in these fields which was signed by the Prime Ministers of Israel and Greece, Mr. Benjamin Netanyahu and Mr. Alexis Tsipras, during the latter's visit to Israel in January 2016. The IATI is glad to keep enriching the bilateral relationship as a source of business and technological opportunities for both sides.